According to practically every futuristic sci-fi flick from back in the day, by now we'd all be whirring through cities in flying cars. And yet, it's nearly 2018 and old-school terrestrial traffic congestion is not only still the norm, but getting worse every day. However, hitching a ride in a flying Uber may soon be a very real and legitimate travel option, following an announcement from the ride-sharing behemoth that it's partnered with NASA to legitimize and fast-track its flying car program, which it plans to launch by 2020. During a speech at this week's Web Summit in Lisbon, Uber's chief of product broke the news that the company has signed a Space Act Agreement with NASA to create a new air traffic control system to help manage its forthcoming fleet of low-flying electric aircraft. That may not seem like a big deal, but the fact that NASA is on board suggests Uber's ambitious plan to take its service to the skies isn't as far-fetched as it once seemed. 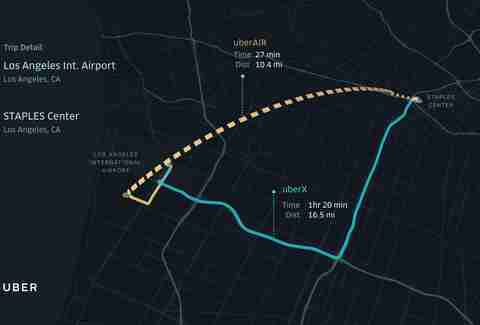 In fact, it doubled down by announcing that it's added Los Angeles as the third city it will begin testing the uberAir programs in 2020. The company also unveiled a new promotional video (shown above) to preview how it envisions the whole operation working. Essentially, you'll request an uberAir ride the same way you would a normal one via the app, only instead of waiting for your car to pull up, you get yourself to the nearest building equipped with a dedicated rooftop uberAir heliport, scan your phone at a checkpoint, and hop into one of its proprietary four-passenger 'copters, bypassing whatever hellish traffic jams are piling up below. 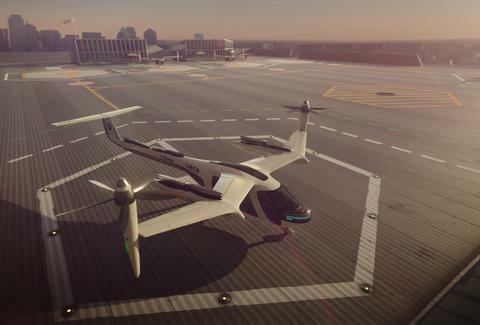 Uber has made no secret of its plans to develop an aerial taxi service, but when it first announced its flying car concept last year, many experts dismissed it as entirely unrealistic and overly ambitious. However, since then it's seemingly made serious progress, partnering with manufacturers to help engineer the sort of lightweight and potentially autonomous vertical take-off vessels the whole operation hinges on, and now, by outlining a path toward organizational safety and regulation (a word that the company has infamously thumbed its nose at). If all goes according to the latest plans outlined this week, the first flying Uber test flights will take off around the Dallas-Fort Worth airport in 2020, followed by similar trials in its two other test cities, Dubai and Los Angeles. Even better, the company is evidently dead-set on ensuring that uberAir will be affordable for the bulk of its users, and not designated as some option reserved for the richest riders.